The Power of the Chiropractic Adjustment. Chiropractic adjustments are the major way that we can help you solve a specific problem and restore your general health. An adjustment is a very specific, focused and gentle input of pressure into a misaligned area of your spine (and other joints of your body), to restore alignment, enhance movement and to improve the health of your nervous system. A physical misalignment in your spine (subluxation) and stress to your nervous system can lead to a variety of problems. the only way to correct this type of problem is with a physical solution. A chiropractic adjustment is just that—a procedure done by hand to physically restore the movement and alignment of your spine. Adjustments remove interference to your nervous system, allowing your nervous system to do its job more effectively. Chemical solutions, like pain-killers, muscle relaxants, anti-inflammatory medications, may dull the pain temporarily. 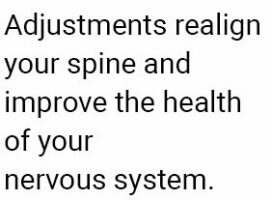 But they cannot correct the cause and physically realign your spinal bones. They may be effective in the short-term to get you through a crisis, but drugs can have many harmful side-effects. Some types of pain-killers can become addictive and have far-reaching negative consequences on your health and life. Adjustments are only given after a detailed consultation and examination designed to determine the precise and most effective way for our Doctors of Chiropractic to approach your health problems. We definitely understand that most everyone wants immediate relief from pain. We want you to feel better fast as well, but the only way to accomplish lasting pain-relief is by focusing on correcting what has caused the pain to occur. That is why the checkup is always the first step. We must have an accurate picture of the problem before we can give you our recommendations for care. Chiropractic adjustments will often be supported by specific stretches, spinal exercises, and possibly traction. Often, chiropractic adjustments will be applied in series, as they are most effective when each adjustment builds on the previous one. They are 100% natural and Doctors of Chiropractic do not prescribe medications or perform surgery. We often coach our practice members through important lifestyle modifications to break bad habits that may be worsening the problem. Adjustments may look simple, but they are very specialized procedures, ONLY applied by highly skilled and trained Doctors of Chiropractic. Never let an untrained or unqualified practitioner manipulate your spine. Always insist on a detailed checkup and thorough explanation of the cause of your problem before receiving adjustments. We all have different health concerns and different spinal conditions that require specific approaches to solve. Health is not one size fits all and that is another reason why we have to examine your spine and understand you before we can move forward with chiropractic care. There are no ball-park estimates or averages when it comes to the number of adjustments you may need or how long you may need to be under care. Those questions are answered through the checkup process. Young people, children, and even babies are among the best people for natural chiropractic care. It is much easier to solve a small problem before it becomes a major crisis. Prevention is more powerful than treatment. By restoring the alignment of a young person’s spine and optimizing the health of their nervous system, we can help them grow to their full potential in life. Chiropractic is all about helping young people grow into their best selves and preventing health problems from developing in the first place. Adjusting a child is very different than adjusting an adult, as much less force is required and very gentle and specific techniques are utilized. Get your children checked today!